flower pot | AN EDIBLE LIFE. 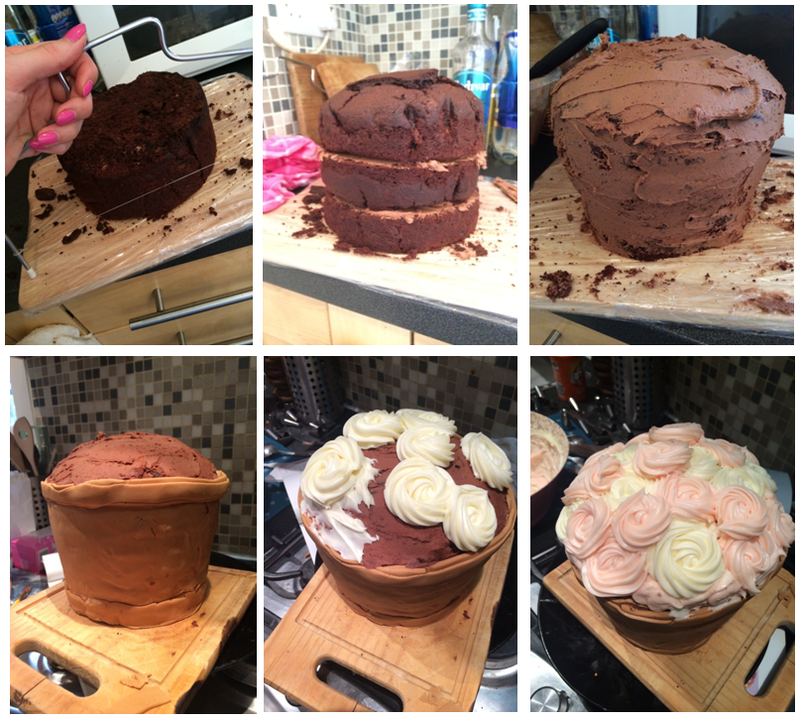 The big day came along (Mothers Day) and it was time for me to make my Fabulous Flower Pot Cake all over again. This was much better idea as the rich chocolate cake literally made your face sweat as it was so intense. 2. To avoid the whole fridge drama (cakes don’t like being in the fridge but cream cheese frosting does!) I decided to make a butter cream for the flowers on top. Unfortunately, butter cream (for some reason, could be my creaming skills) doesn’t create a smooth edge when piped into a flower shape. Which looks messy. And I wish I had stuck with the cream cheese frosting. 3. 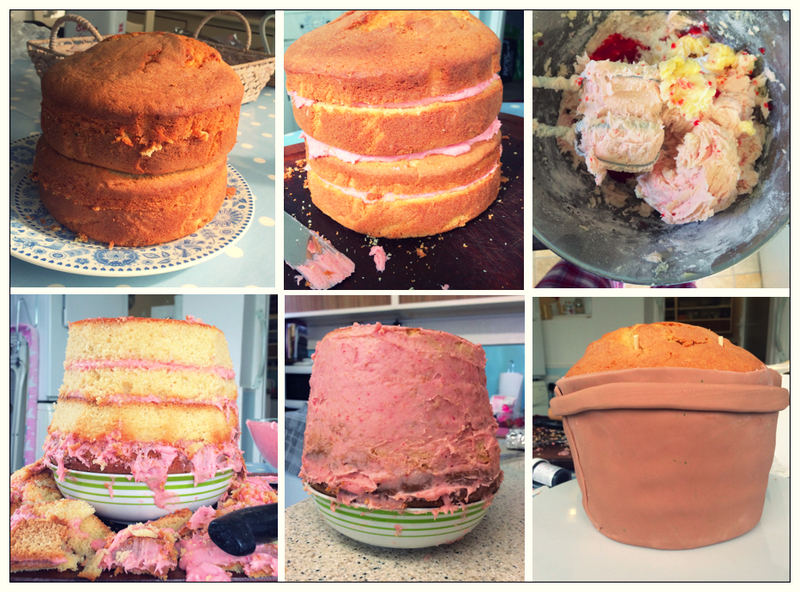 I made a fresh strawberry butter cream for the filling and the crumb coating – it was SO tasty but a little running. I didn’t dry the strawberries after washing and in hindsight I realised I probably should have. I used some of the left over strawberry butter cream to pipe some of the flowers and it was a nightmare as it was so runny! oops. Overall, the cake was a success! I do wish I had pipped the flowers on more neatly but I was having some issues with thickness of butter creams etc. and slowly losing the will to live so they got a bit messy. I was pleased with the end product and my biggest critics, the fam, seemed to be pleased also! Horrah! SO, being the *amazing* daughter I am, I decided I wanted to make my mum a really fancy cake for mother’s day. This was the first 3D cake I have ever made and the first cake I have ever used fondant icing with…so it was a pretty big challenge. 1. I stupidly (or really cleverly?) chose a ‘rich chocolate cake mix’ which was REALLY tasty but at the same time so so rich – like make-your-face-sweat rich. 2. The was so heavy…the density of the cake was unbelievable and it was literally like a brick making it difficult to move around/eat. 3. I got over excited and crumb coated it before I should have. In hindsight I should have turned it upside down (in a bowl) and crumb coated it so I could then put the fondant icing on properly. Because I did not do that, I had to kind of drape the fondant around the edge, leaving it all wrinkly and gathered and stuff. Definitely not a professional look. 4. I didn’t have enough fondant icing – I thought 250g would be enough, but it was not. Too thin = very wrinkly. After I had assembled my cake, I realised I had I ran out of icing sugar (SO ANNOYING WHEN THIS HAPPENS) so my cream cheese frosting was slightly runnier than it should have been – well I think that’s why it was runny. Also N.B. cake and fridges don’t really go well together (cue mega crumbles), so I won’t be using a cream cheese frosting again as I like to keep this in the fridge, and with it being such a MASSIVE cake it’s hard to eat in one day. 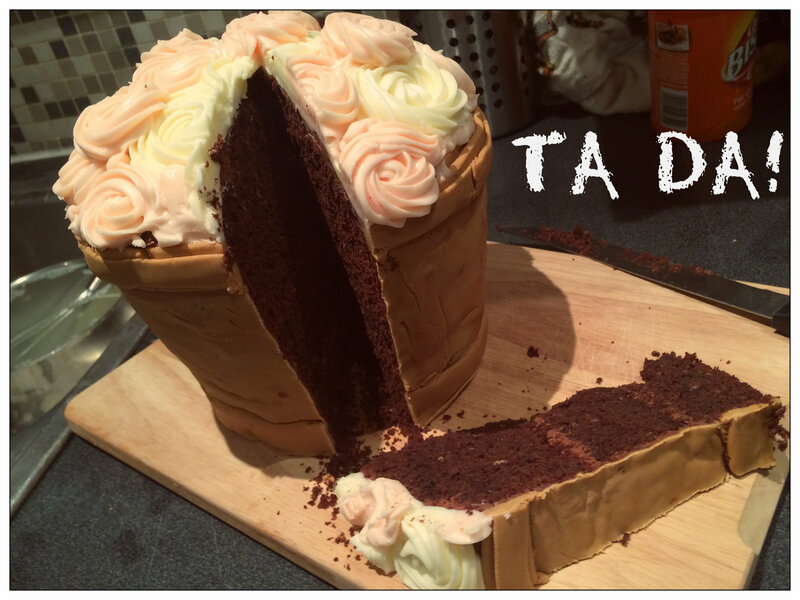 Apart from all of the abouve…I was VERY pleased/proud for my first attempt at a ‘proper’ cake. I am going to re-make this cake this weekend but instead will make a madeira cake and a fresh strawberry buttercream. Should be much lighter and yummier!